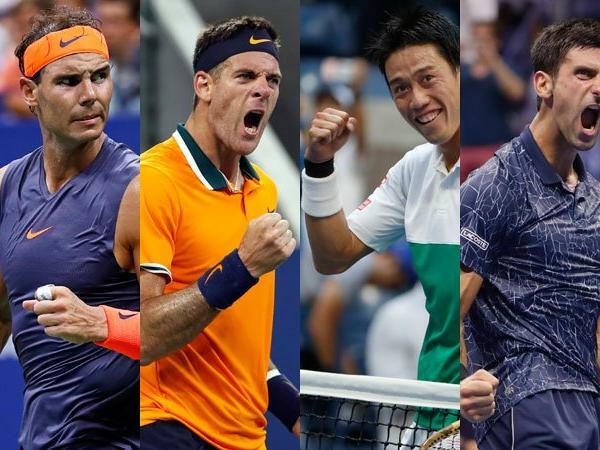 Here are my predictions for the men's semifinals at the US Open for 2018. Last year I correctly predicted 3 of 4 women's quarterfinals, correctly predicted 2 of 4 men's quarterfinals, 2 of 2 men's semifinals and 1 of 2 women's semifinals. This year I have correctly predicted 3 of 4 women's quarterfinals, 3 of 4 men's quarterfinals and 1 of 2 women's semifinals. Rafael Nadal (ESP)  vs. Juan Martin Del Potro (ARG) . This is a reprise of the 2017 US Open semifinal, which was handily won by Nadal in four sets that included a bagel. However, this year has been a resurgent one for the 2009 champion: he's at career high ranking of World #3 and (finally) one his first ATP Master series title (on American outdoor hardcourts) at Indian Wells. Additionally, Nadal has had some surprisingly tough matches en route to the semifinals this year, including two 4-set wins against low-ranked players like Karen Khachanov and Nikoloz Basilashvili. And no one expected that his meeting with Dominc Thiem (not exactly known as a hardcourt powerhouse) would become the epic 5th set tiebreak match it did. Del Potro has beaten Nadal 5 times in 16 meetings and while Nadal has battled to get to this point, del Potro has only dropped one set (a first set tiebreaker to John Isner) to date at this year's Open. With all that being said, it's hard to see del Potro achieving the upset here against the #1 player in the world. Mad Professah's pick: Nadal. Novak Djokovic (SRB)  vs. Kei Nishikori (JPN) . This is a reprise of the 2014 US Open semifinal which was one of the two times Nishikori has beaten the 13-time major champion in their 16 meetings. Of course major semifinals are incredibly important matches. Nishikori is playing in his 3rd, all of which have happened in New York. I believe that he will win a set and possibly two sets, against Djokokovic but I have a hard time envisioning him winning three sets today. Nishikori had a great result in the quarterfinal outlasting Marin Cilic in five sets, getting revenge for losing the 2014 US Open final to the same opponent, despite being up an early break and losing it late in the deciding fifth set. In fact, Nishikori has a hall-of-fame record in deciding sets on the ATP tour including an astonishing 18-6 record in 5th sets. So if the match gets that far I would give him the edge, but I don't think the match will get that far. Mad Professah's pick: Djokovic.